Earlier in the year British APCO with the help of our web and social media specialist, Sasha Taylor, created the Multi Agency Incident Transfer (MAIT) website, so that the Home Office and other partners could showcase the proposed MAIT standard to enable data sharing. 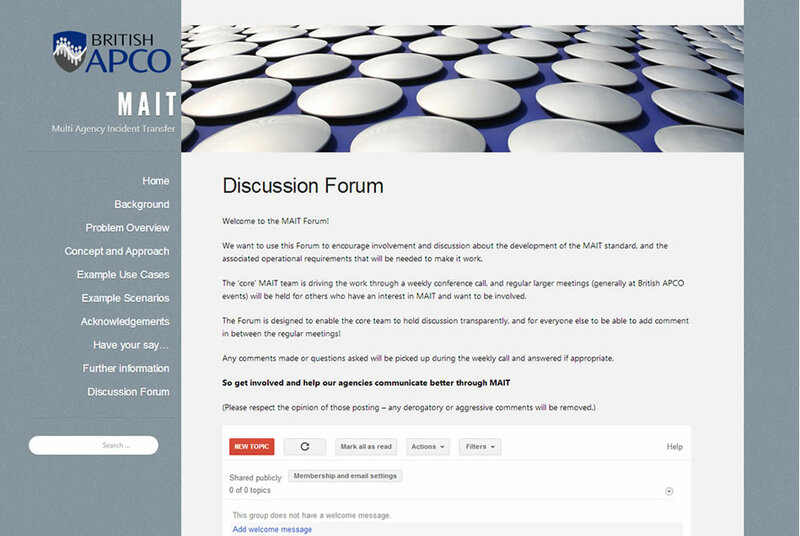 We have now added a discussion forum area to the website so that British APCO can encourage involvement and discussion about the development of the MAIT standard, and the associated operational requirements that will be needed to make it work. The ‘core’ MAIT team is driving the work through a weekly conference call, and regular larger meetings (generally at British APCO events) will be held for others who have an interest in MAIT and want to be involved. The forum is designed to enable the core team to hold discussion transparently, and for everyone else to be able to add comment in between the regular meetings! Any comments made or questions asked will be picked up during the weekly call and answered if appropriate. So get involved and help our agencies communicate better through MAIT. ← Open Data – What’s the point?